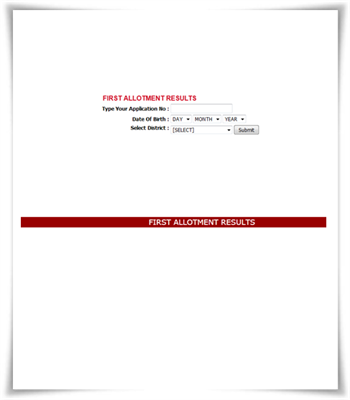 The first allotment list of Kerala Plus One Admission 2014 got published on 29th June 2014 at the official website of Department of Higher Secondary Education (DHSE). Students who had applied for the Plus One admission 2014 under the single-window system can check their allotment status from today. Students who got allotment should compulsorily secure admission at the respective schools before 5 p.m. on 2nd July. Students who found their name in the first allotment list should remit fee and secure permanent admission in the allotted school. As the complete admission procedure is done through the Single Window System (SWS), students can know their allotment status by providing their application number and date of birth in the relevant columns. Students have to login by entering his/her application number, password and district. All those differently abled (Blind, deaf, physically handicapped, Mental and brain diseases) students who had applied for the admission are give allotment in the first phase itself. The sports quota allotment results will be published on 1st July while the admission is scheduled for 1st and 2nd July 2014. The main allotments will come to an end on 9th July 2014. The first year plus one will commence on 14th July while the admission will be closed on 27th August 2014. The two months training for 27,000 teachers will be conducted in three schedules. As the allotment will satisfy only 3.67 lakhs students, the rest would have to purse higher education with the open school system.